There's a new crossover in the Honda family this year, and it comes in the shape of the 2019 Honda Passport. Every manufacturer is keen to bolster its SUV lineup these days as they seem to be the only vehicles many buyers are interested in for now. Honda already has a number of very popular and successful crossovers in its portfolio, so just where and how does the Passport slot in? To find out, here's a comparison with the 2019 Honda Pilot, which has an almost identical starting MSRP, and is also the model the Passport is largely based upon. The Pilot and the Honda Passport are both classed as midsize crossover SUVs, they have identical wheelbases, but the Honda Pilot is the longer of the two by six and a half inches. Even though the Pilot is bigger and can accommodate three more passengers, there's almost nothing in it when it comes to prices. Actually, it's the smaller Honda Passport that's the more expensive` of the pair, but not by much. The Passport has a starting MSRP of $31,990*, while the Pilot costs from just $31,450*. As we said, it's not a big difference, but if you’re shopping on a very tight budget it could be a consideration. Passport is 6.5 inches shorter at just 190 inches. The Passport might be an inch taller than its bigger brother, but the Pilot offers 152.9 cu.-ft. of passenger space and the Passport can manage just 115.9 cu.-ft. of passenger volume. The front and rear fascias look reasonably different when you see these two parked next to each other. The Passport definitely looks sportier, more youthful and perhaps even a bit more aggressive. At the front of the Passport, there's a larger mesh grille and a bumper that comes up to meet it in the middle. The extra height and shorter length of the Passport mean it's more SUV than the Pilot, which from some angles can look like a tall wagon. At the rear, it's a similar story, although the differences could be more noticeable to casual observers than those at the front. The tailgate of the Pilot has backup lamps integrated into it, while the Passport chooses to incorporate them into the rear bumper instead. It's another area where the Passport looks sportier, fresher and more "today" than the Pilot, which might be the whole point of Honda introducing this new model. 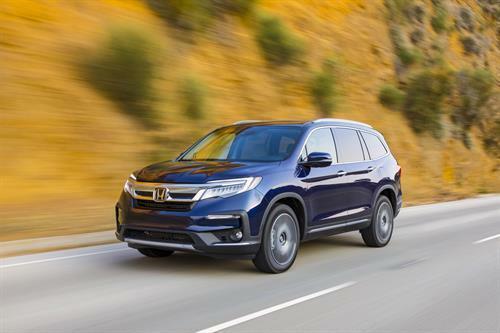 The 2019 Honda Passport has Honda's familiar 3.5-liter V-6 gas engine under the hood that produces 280 horsepower and 262 lb.-ft. of torque. The power is then sent to the front or all four wheels through a very good nine-speed automatic transmission. This engine is powerful, smooth and particularly quiet, and all-wheel-drive models can be reasonably good off-road. The Honda in all-wheel-drive form has Normal, Sand, Snow, and Mud settings, and these are designed to adjust traction control, throttle response, and the transmission to adapt to various off-road environments and conditions. This probably won’t come as a massive surprise, but the Pilot features an identical powertrain. The extra length and weight of the Pilot could mean the shorter, lighter Passport will feel slightly nimbler, but not a huge difference otherwise. If your buying decision for a new midsize SUV is based on ultimate practicality, flexibility and utility, the eight-seat 2019 Honda Pilot is definitely the best option. However, if a third-row seat isn’t needed, and if you're more concerned about how your vehicle looks, the 2019 Honda Passport is probably the way to go. For more details about the Pilot and Passport, to schedule a test drive, or to learn more about 2019 Honda models in general, don’t hesitate to check out our website and get in touch with us here at Mel Rapton Honda.